My mother, in spite of her strict Protestant upbringing, applauded my creativity as a child. She sewed a costume entirely out of crêpe paper when I wanted to be Queen of Hearts at our village fancy dress competition, and didn’t say a word when I painted one my bedroom walls black, splashed with red, white and blue Dulux gloss. Like most mothers and daughters, we had our issues, particularly when I was a teenager. I wince at some of the things I said and did, and no doubt she regrets a few of her actions too – although, to be fair, she had four children, a full time job and little help at home from my dad, so it was no wonder she was a little sharp-tongued at times over my shenanigans. Vanessa’s field work is in Namibia, and she shuttled Laura back and forth between Africa and London as a child, so she could continue to have a career in the sciences – and see her daughter. Laura is bitterly resentful; as a result, she now puts Autumn’s needs before her own. Unlike her mother, though, she doesn’t have the confidence or the inner-strength to help her child properly – because, thanks to her peripatetic childhood, she was bullied as a girl too. If she just asked her mum for help with Autumn…! The first part of Laura’s healing process occurs when her mother describes how awful she found it, leaving baby Laura with a Namibian man, so she could carry on studying. Laura hadn’t realised she’d mattered so much to her mum, who she thinks of as completely career-driven. But then, as so often happens between mothers and daughters, Vanessa says something that Laura misconstrues, and she turns away from her mother, deciding not to ask for her help. Autumn’s relationship is similarly complicated, not just with her mother, but with her grandmother too. She could already feel the dryness in her throat, the catch in her voice, when she’d have to stand up in class and tell everyone what her grandparents did. After the other kids read out their work on grannies who baked them squidgy chocolate chip cookies, she could imagine how the others would look at her when she talked about Grandmother Vanessa who strode through the desert with her binoculars, counting kudu. The smallest remark can bring into focus the biggest question that hovers over nearly all conversations between mothers and daughters: Do you see me for who I am? And is who I am okay? When…the answer implies there’s something wrong with what you’re doing, daughters can feel the ground on which they stand begin to tremble. You bring a child into this fractious, chaotic world out of the heat of your womb, and then spend the next ten years walking beside them while they figure out how to be a person. I hope Laura and Autumn learn to walk companionably alongside each other for the next decade. 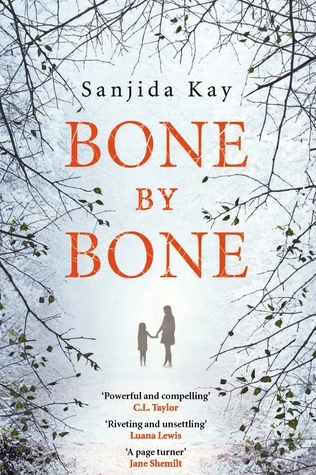 Bone by Bone is published by Corvus Books and is out in paperback from 1st September 2016. But her nine-year-old daughter Autumn is being bullied. Laura feels helpless.